Emusion film masks are cheap silver emulsion film mask on PET films. They are quite cheap and easy to use although the resolution are generally limited >30micron depending of the manufacturer and the thickness of the emulsion film. In general the emulsion side is direct contact with the photoresist and the exposure light transmits through the film to obtain the best exposure resolution. We can make chrome mask in house using maskless lithography and precoated chrome blank plate. For patterns close to Abbe's limit, the diffraction of light makes the pattern difficult to be precisely made. Several advanced masks are made for these purchases such as phase-shift mask. But the field of nanopatterning is a bit outside the scope for general microfluidic applications. it's difficult to get reasonble results below 50 micron. I thank Mr. Kei Funakoshi for information on mask fabrication services in Japan. but with tax close to $80bucks making each design ~ $55. 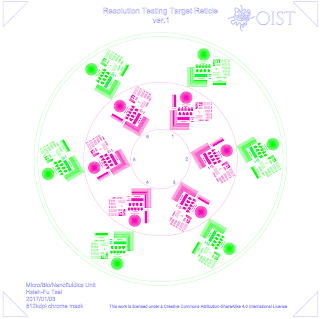 Several resolution testing target designs have been developed in the field of optical imaging for inspection of resolution power of optical components in imaging industry. For examples 1951 USAF target has been used extensively. Also Ronchi ruling, grid patterns, concentric circles, focault tests, Siemens stars and others have also been used. Aim: To develop a 5 inch chrome mask with high resolution patterns to test the resolution of 1:1 exposure system as well as testing the exposure condition (power and time) for optimum results. We will take advantage of a Suss microtech 6 section exposure accessories and design the resolution testing mask on top of it. In each section, we have designed the same design containing the following patterns in both positive and negative form. 9. 50micron line weight with different spacing from 1, 3, 5, 7.5, 10, 12.5, 25, 37.5, 50, 75, 100, 150, 200, 250 micron. The work is licensed under a Creative Commons Attribution-ShareAlike 4.0 international license. 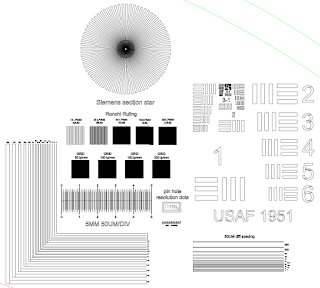 In the original file you can find more groups of USAF 1951. the USAF1951 target is made according to the spec documented on wikipedia. The photo the a made mask looks like this. You can download the files on my google drive.